Fostering innovative and open methods and tools in the classroom and beyond. Expanding the scope and impact of traditional and digital humanities for the contemporary world. Thinking critically about the role and design of technology, data and the social sciences in our lives and learning. Postmortem: Bodies, Games and Boundaries. Promoting openness, access, and diversity in technology, and education in service of an equitable society. Is Segregation Still Alive In The Classroom? Promoting change in schools, museums, libraries, and other organizations. Advocating for new forms of scholarly communications, including blogging, multimedia, open publishing, and academic journals and presses. Overview: This post compiles two previous blogs from hastac.org (originally published in June 2015 and October 2017) and concludes with a bibliography of scholarship on active learning (or "radical pedagogy"). The first blog post focuses on basic engaged pedagogy methods, some of which go back to the Freedom Schools, some extend as far back as Maria Montessori. Some come from the Occupy Wall Street movement, others from K-12 teachers, still others from medical school practices. All are based on the premise that simply asking people to "contribute" to a conversation (in a faculty meeting or in a classroom) seems open and fair but, as much sociological research shows, typically ends up replicating the values of the person in charge or privileges those from elite backgrounds who have been well-schooled in (often unspoken) social and cultural clues and capital. Why try these methods? (1) If your personal goal is equality in a world where inequality is structural and violent and pervasive, engaged learning allows you to restructure your classroom with equality at the core. (Here's the adage: You cannot counter structural inequality with good will; you need to create structures designed for equality.) You cannot structure all the rest of education or society--but you can at least start with your classroom as a place in which to model a better way. (2) Engaged learning methods work. We've known at least since Ebbinghaus's memory experiments of the 1880s that students (like all of us) forget up to 75% of the tested or "testable" content learned in a course within six days after taking a summative, high-stakes exam in a course. Active learning--peer-to-peer explanation, exchange, individual research on the topic, and methods described below--increase retention, understanding, and applicability well beyond the test. NB: Special thanks to Graduate Center doctoral students and Futures Initiative Fellows Christina Katopodis and Danica Savonick for their contributions to this post. You cannot counter structural inequality with good will. You have to structure equality. Transforming your classroom to a more equitable, engaged space is a great way to begin–for your students and for you. I’m often asked why I start with pedagogy, given the larger, far-reaching institutional reforms and social ambitions that The New Education, HASTAC, and the new Futures Initiative program all advocate. My answer is simple and pragmatic: If your personal goal is equality in a world where inequality is structural and violent and pervasive, you can at least start with your classroom as a place in which to model a better way. You can do this without in any way diminishing the quality or the standards of your subject area. In fact, the research on active learning strongly suggests your students will learn more by learning how to engage the subject matter through their own research, in projects they define, and even in the very simple techniques (described here) that you can use tomorrow. The American Psychological Association calls these methods “Total Participation” not only because they are designed so that each and every student has a way to contribute but also because they strive to give students agency in their own learning. These techniques work whether you have a seminar of 16 students or a lecture hall with 600. The professor’s role in the engaged classroom is crucial. Not only do you “scaffold” learning opportunities, but you provide expertise (not infallible but invaluable) as needed. At the end of each exercise, you can also make sure to conclude with “meta-cognition,” reflection on why and what you have just done and on what it means. You can engage students in this reflective exercise too, asking what it feels like, how the temperature in the room changes even, when power relations are reversed and the participants take a leadership role. Without reflection, students might not understand what just happened (and you might miss some of it too). Ask them what it felt like to talk through an answer with another student, not just to sit there and hear the same four classmates dominate every class “discussion” (we have the stats on how a few students dominate even in small seminars). Sometimes students resist active learning. Remember: they have had at least twelve years of practice/indoctrination in mastering the formal education methods where hierarchy and control displace all the complex, experience-based, interactive learning methods (i.e. the kind we all use in our lives outside of formal education when we really want to learn how to do something). Because they have been rewarded for credential-centered and teacher-centered learning in school, some will think you are trying to get out of work or pulling a fast one by having them do the thinking and taking responsibility for their own learning. Some, conversely, will feel as if they just want to know what’s on the test so they can study for it the night before and get their passing grade. They are after the credential and don’t care about the learning. I typically note that these are extensively researched theories, practices, and methods designed to help students learn not for the test or the grade but for the best possible retention and application of complex ideas that they will use in this class, in other classes, and in their lives beyond school. And I expect some resistance. All of this is true and it is useful to state it up front. If you are untenured, it is even useful to put some reflection on methodology into a syllabus and to cite sources. As you will see at the bottom of this blog, you can even quote Martin Heidegger to support your pedagogy. In his 1951-52 essay, “What Is Called Thinking,” the famously difficult philosopher underscored the importance of the professor being always, forever a learner rather than simply someone with the answers. He argued that “letting learn” was the true goal of higher education. I. Why start with pedagogy? 1. It is in your control. There are so many huge and pressing and overwhelming issues facing higher education and our society, most of which require significant changes in funding, policy, priority, reward systems, and accreditation structures–not to mention major social realignments of race, gender, sexuality, income, citizenship, and on and on. No one can accomplish all that needs to be accomplished. We all need to be working (and are working) to change structural inequalities at every level. While we’re working on transforming the world and higher education, we are not off the hook in our individual lives and in our professional practice. The classroom is one of the least egalitarian spaces on the planet. Freire and hooks insist that it is in the traditional classroom that students “learn their place.” There is abundant research on who gets into college, who gets out, what kind of college you go to, and how all relates to income inequality, racism, and gender issues. There is also plenty of research on how little it takes (roughly 20% participation) for a teacher to believe there is “full participation” and to believe it is a “good class” where “everyone is participating.” There is also extensive research on the prejudicial ways that race and gender factor into who talks in class, gets the professor attention, is given leeway on grades, responses to queries, and more. A professor who does not structure a classroom for equal participation replicates social inequalities (again lots of research on this), especially if the professor is white in a mixed race classroom or male with a class of men and women. Who gets to talk? Where is the teacher? Who has the knowledge? Even in seminars with “discussion,” who hogs the floor, who is the boss, who is too ashamed to speak? Learning inside formal education is different than successful learning almost anywhere else—and it is almost universally effective at implicitly and sometimes explicitly inculcating social values: who has knowledge, who has power, what counts as knowledge, what makes “our tradition” and how does that tradition include or exclude “us.” Epistemology, curriculum, and pedagogy are all different aspects of the same social lesson plan. 3. It works. Soliciting what the American Psychological Association calls “Total Participation,” structuring a way where everyone in the room has a voice and has an opportunity to register an idea, is by far the most effective way to avoid “group think.” In the traditional seminar room, one person shoots a hand up first and then others either agree or dissent but that first comment directly or indirectly sets the parameters of a conversation. With inventory or Total Participation methods, everyone writes out an idea, speaks the idea, and everyone then has a full array of possible responses. There’s always an intriguing surprise that, in a traditional seminar, might never be articulated. In the worst traditional environments (such as Board rooms with the CEO present or in community meetings with a culture of one person claiming to be the “most radical” in the room), once the most powerful person speaks there is little chance of other perspectives emerging. Structuring total participation is the best way to counter these tendencies (in classrooms, in department meetings, in civic organizations, and in corporate boardrooms; I’ve seen the techniques used with equal success at #Occupy and with groups of Fortune 100 CEOs–and in dozens of classrooms, of all sizes, in all fields). All of the methods below are useful and there are many more in the books and articles appended in the bibliography. I’ve personally used these techniques in a group of five coworkers, in a community meeting with a dozen people, in class of 20 students, in a class of 200 students, in a lecture hall with 500 people, and in the Philadelphia 76’ers stadium with 6000+ IB high school teachers. Also, the more you think about how giving power to others enriches everyone’s learning, lightens your own load, and makes everyone less alienated, the more you see why democracy is preferable to oligarchy. You are not just modeling a classroom practice but a social ideal. That gives meaning and affect to all the other conditions of social inequality you may want to address. However, even if you have no interest in social equality, just putting student inquiry at the center of a classroom helps everyone learn better, deeper, and more. The research of Harvard physicist Eric Mazur has demonstrated that in some stunning ways. Active learning is just better, in the short run, and models a better social role for higher education, in the long run. 4. It is gratifying and gives you energy and inspiration for the bigger institutional battles. Social activism and institutional change are difficult. Victories should be celebrated because we need to keep our spirit up to fight against legislators cutting funding and programs and tenure; the horrific adjunct crisis that must be reversed immediately; the soaring cost of tuition and the immoral tuition debt with which we saddle the next generation; the irrelevant curriculum designed for the Taylorist era of the assembly line and not for the world we live in now; the standardized metrics that test only how well prepared you are to take standardized tests (in itself largely income based); the soaring educational inequality that exacerbates income inequality. Etc. There is so much work to do. So why not see your students thrive, see them enjoying their learning, see them becoming engaged in ways they were not before, see them learning and designing learning that is far more ambitious and thoughtful and deep than you had thought possible. All that is gratifying and inspiring. It is joyful. We need joy and positive energy to fight all the battles ahead. In Think-Pair-Share, you hand out index cards and pencils (this is not necessary but it somehow sets the mood fast and fast is impottant in TPS). THINK: You set a timer for 90 seconds (really, 90 seconds). And you pose a question. For example, if this were a class on “Why Start With Pedagogy?” I would ask everyone to take 90 seconds to jot down three things (there are no right or wrong answers) they do in their classrooms to engage students. After the pair has listened to one another, they then (still within the 90 seconds) work quickly together to edit, merge, or choose one thing they will “share,” together, with the group. 2. Everyone Raise Your Hand. No extra time needed. 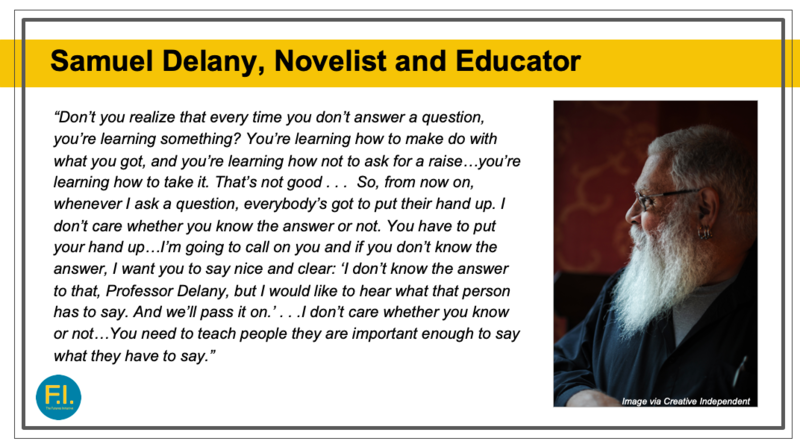 This is an exercise developed by the great science fiction writer Samuel Delany. He never went to college and had a romantic idea of what it must be like. He was shocked when, having achieved eminence as a writer and been asked to teach his first college class, he asked a question and saw shame and fear in the faces of some of his students. As a queer African American writer, he especially felt dismay when queer and Black students shied away from answering. 3. Question Stacking No extra time needed. I learned this method from a student, too, and she learned it from the Occupy movement. It’s an alternate way of structuring equality in the classroom to the Delany method above—and it works great in department meetings, too. To ensure no one hogs the discussion, when someone has a comment to make, you write their name down on a sheet. You go through the sheet and ask for comments. No one asks a second question or makes a second comment until everyone else whose name is on the sheet has gone first. (You can also have a sign up sheet and have students come up to the podium to sign up. Or you can have a line and answer each person in order.) Also, set a time limit of one minute per question and have a timer set. People will adjust to the time quickly. It makes a difference, sets a practice of consideration, respect, and egalitarianism in a structural way. 4. The Exit Ticket. Three minutes of class time. End every class three minutes early—set a timer if you need to. It’s an important practice in itself, reminding oneself to end on time. On those index cards, have every student write the one question that is still on their minds at the end of the class. After a particularly vibrant or controversial class, I like to ask: “What topic did we raise today that is going to keep you up tonight? If nothing, what should we have asked that would keep you thinking into the night?” Ask that the card be full sentences. Have them sign the card. Everyone leaves with a parting thought written out carefully; it makes for deeper reading for the next class. (If you do this with a Google Doc, everyone sees the questions that remain and that causes a different kind of post-class introspection.) You as a professor can read all their questions and use that to help shape the next class period—perhaps tomorrow’s Think-Pair-Share. A friend who teaches lectures of 200-400, does this to take role and he and his TA’s use the questions to guide their smaller discussion sessions and he uses them to shape his next lecture. It is efficient, engaged, and useful on many levels. 5. The Entry Ticket. Of course, you can also begin your next class with an Entry Ticket on which each student writes the one idea that sticks with them most from the reading assignment. Last term, a student taught me an eloquent and surprisingly moving way to do this. She has students transcribe one sentence or quote from the reading that sticks with them, either because they love it, hate it, or are confused by it. She then goes around the room and has each student read their sentence. This shows many things, including how we may think we are all reading the same text, but our attention and interests actually shape and select what we read, what we remember. It’s a fascinating way to begin a class and students tend to come much more prepared when they know they will be asked to contribute in a meaningful way. Turning the classroom from a site in which authority is modeled and rewarded to one in which there is Total Participation—where each student has a voice, agency, active participation—is an important step to turning your classroom into a site of equality and activism, not passivity. As is the case with all democratic action, you have as much to learn from this experience as your students do. Adapted from How To Make #NewEducation Work In Your Classroom Today,” hastac.org, October 11, 2017. KEYWORDS: Assign a Heidegger essay. Along with the essay, give students a worksheet with, say, twenty complex concepts that Heidegger uses in the essay–say, Being, Time, Temporality, Authenticity, Enframing, Being-Towards-Death, etc. ; in other words, key concepts or “keywords” that philosophers of Heidegger’s work have spent time debating. During the next class, instead of beginning with a lecture on Heidegger, have the students with the same word pair up, work on their definition in a fixed amount of time (no more than 5 minutes), and then go around the room and have each pair read their definition of the keyword out loud. Use those definitions as a point of departure for discussion. I promise, you will never have a more alert, engaged, livelier class on Heidegger. At the end of this class, have both students sign the final definition they’ve co-authored and hand it in to you. You will be able to use these student-defined keywords as an excellent jumping off point for your next lecture on Heidegger (if you must lecture). All of this supports (“scaffolds”) their learning. Learning (even someone as difficult as Heidegger, especially someone as difficult as Heidegger) is a process. Heidegger called this “letting-learn” in his important book, “What is Called Thinking?” (1951). For a useful annotated bibliography of useful resources, see Kitana Ananda, “Student-Centered Pedagogy: An Annotated Bibliography of Key Texts,” hastac.org, November 4, 2016. For a detailed guide to methods used by Cathy Davidson’s students in “American Literature, American Learning,” see Danica Savonick, “Orchestrating a Student-Centered Classroom: A How-To Guide,” hastac.org, Dec 5, 2016. Armbruster, Peter, et al. “Active Learning and Student-Centered Pedagogy Improve Student Attitudes and Performance in Introductory Biology.” Ed. Debra Tomanek. CBE Life Sciences Education 8.3 (2009): 203–213. PMC. Web. 30 Oct. 2017. Barkley, Elizabeth F., et al. Collaborative Learning Techniques: A Handbook for College Faculty. San Francisco, CA: Jossey-Bass, 2005. Bean, John C. Engaging Ideas: The Professor’s Guide to Integrating Writing, Critical Thinking, and Active Learning in the Classroom. San Francisco: Jossey-Bass, 1996. Bransford, John, et. al. How People Learn: Brain, Mind, Experience, and School. Washington, D.C: National Academy Press, 1999. Crouch, Catherine H., and Eric Mazur. “Peer Instruction: Ten Years of Experience and Results.” American Journal of Physics, vol. 69, no. 9, 2001, pp. 970–977., doi:10.1119/1.1374249. Davidson, Cathy N. “The Single Best Method for Class (Or Any Kind of) Participation (Thx SciFi Genius Samuel Delany),” hastac.org, Feb 2, 2015. ——-. Now You See It: How the Brain Science of Attention Will Transform the Way We Live, Work, and Learn (Viking Penguin), 2011. ——-. The New Education: How To Revolutionize the University To Prepare Students for a World in Flux (Basic Books, 2017). ---. "How Would You Remake the English Major?" hastac.org, https://www.hastac.org/.../how-would-you-remake-english..
Freire, Paulo. Pedagogy of the Oppressed. New York: Continuum, 1968 (1970). See also Pedagogy of Hope: Reliving Pedagogy of the Oppressed (Continuum, 1994) and Pedagogy of Freedom: Ethics, Democracy, and Civic Courage (Rowman & Littlefield, 1998). —–. Teachers As Cultural Workers: Letters to Those Who Dare Teach. Boulder, Colo: Westview Press, 1998. Giroux, Henry A. Teachers as Intellectuals: Toward a Critical Pedagogy of Learning. Westport, CT: Bergin & Garvey, 1988. HASTAC Scholars. “The Pedagogy Project.” HASTAC, www.hastac.org/pedagogy-project. HASTAC Scholars. Structuring Equality: A Handbook for Student-Centered Learning. Ed. Hilarie Ashton. New York: HASTAC, 2016.
hooks, bell. Teaching to Transgress: Education as the Practice of Freedom. New York: Routledge, 1994. See also Teaching Community: A Pedagogy of Hope (2003) and Teaching Critical Thinking: Practical Wisdom (2007). Howard, Rebecca Moore. “Collaborative Pedagogy.” A Guide to Composition Pedagogies. New York: Oxford University Press, 2001. Jones, Leo. The Student-Centered Classroom. Cambridge: Cambridge University Press, 2007. Jones, Steven. “‘Ensure That You Stand Out from the Crowd’: A Corpus-Based Analysis of Personal Statements According to Applicants’ School Type.” Comparative Education Review, vol. 57, no. 3, 2013, pp. 397–423. JSTOR, JSTOR, www.jstor.org/stable/10.1086/670666. Katopodis, Christina. "Researching Together in Your Lecture," hastac.org, October 27, 2017. https://www.hastac.org/blogs/ckatopodis/2017/10/27/researching-together-..."
Lorde, Audre. “Poet as Teacher–Human as Poet–Teacher as Human,” I am Your Sister: Collected and Unpublished Writings of Audre Lorde. Ed. Rudolph P. Byrd. New York: Oxford, 2009. Montessori, Maria, and Anne E George. The Montessori Method. New York: Schocken Books, 1964. Muhs, G. G. & Niemann, Y. F. & González, C. G. & Harris, A. P. Presumed Incompetent: The Intersections of Race and Class for Women in Academia. Logan: Utah State University Press, 2012. Omolade, Barbara. “A Black Feminist Pedagogy,” Women’s Studies Quarterly, vol. 15, no. 3/4, 1987, pp. 32-39. Prendergast, Catherine, et al. “A Lecture from the Lectured.” Chronicle Vitae, January 4, 2016. Rancière, Jacques. The Ignorant Schoolmaster: Five Lessons in Intellectual Emancipation. Stanford, CA: Stanford University Press, 1991. Savonick, Danica. “Community Guidelines: Fostering Inclusive Discussions of Difference,” hastac.org, August 28, 2017. —–. “Introduction to Narrative: A Collaborative, Experimental Intellectual Adventure,” hastac.org, May 18, 2015. —–. “Teaching Race and Gender Theory in the Undergraduate Humanities Classroom: A Toolkit,” hastac.org, June 13, 2017. Savonick, Danica, and Cathy N. Davidson, “Gender Bias in Academe: An Annotated Bibliography of Important Recent Studies,” hastac.org, January 26, 2015. Scorza, D’Artagnan, et al. “It Should Just Be Education: Critical Pedagogy Normalized as Academic Excellence.” The International Journal of Critical Pedagogy, vol. 4, no. 2, 2013, pp. 15-34. Shor, Ira. Freire for the Classroom: A Sourcebook for Liberatory Teaching. Portsmouth, NH: Boynton/Cook, 1987. Steinberg, Shirley R., et. al. “Home.” Freire Project, Critical Cultural Community, Youth, and Media Activism, www.freireproject.org/. Stommel, Jesse. “Dear Student,” jessestommel.com, December 16, 2015. Tompkins, Jane. A Life in School: What the Teacher Learned. New York: Perseus, 1996. Vianna, Eduardo, and Anna Stetsenko, “Research with a Transformative Activist Agenda: Creating the Future Through Education for Social Change,” National Society for the Study of Education, vol. 113, no. 2, pp. 575-602. Weimer, Maryellen. Learner-Centered Teaching: Five Key Changes to Practice. San Francisco: Jossey-Bass, 2002. By accessing this site you agree to be bound by the Legal Agreement. Except where otherwise noted, all content on this site is licensed under a Creative Commons Attribution-NonCommercial-ShareAlike 3.0 License.